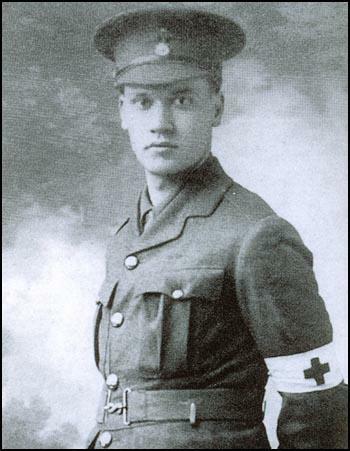 From 13 November 1914 Nevinson and his father worked with the Friends’ Ambulance Unit and the British Red Cross Society in “the Shambles”, tending the three thousand wounded French troops who had been evacuated and who were dumped in a disused railway shed at Dunkirk. After a couple of months, this work was taken over by the French themselves, and Nevinson was reassigned as an ambulance driver. Judging by what Nevinson subsequently claimed, this last was a major contribution to the war effort; in fact, because of his rheumatism he was only able to do it for one week. In January 1915 he returned to Britain. He vigorously defended himself from those who belittled his brief stay: “I have spent the last three months at the front in France & Belgium amongst wounds, Blood, Stench, Typhoid, agony and death”, he wrote in an unpublished letter intended for The Times (Welch 99). He was also beginning to think about how he, as an artist, could present the War, without glorifying it as Marinetti would want to do and, indeed (presumably as a result of his experiences) tending to see art as a way of criticising the war. In the article In an article “Painter of Smells at the Front: A Futurist’s View of the War”, published in the Daily Express 25 February 1915, he wrote “Unlike my Italian friends. I do not glory in war for its own sake, nor can I accept their doctrine that war is the only health-giver […] Our Futurist technique is the only possible medium to express the crudeness, violence and brutality of the emotions seen and felt on the present battlefields of Europe” (Welch 98, 108). By May Nevinson was thinking of returning to France with there Friends Ambulance Unit, but even his influential father failed to do this for him. In 1 June he went with his father and was sworn in as an orderly in Royal Army Medical Corps, in Wandsworth, at the Third London General Hospital, which specialised in shell shock and severe facial injuries. During this period, in November, he married Kathleen Knowlman at Hampstead Town Hall. In January 1916 he was invalided out, with acute rheumatic fever; he even spent some time in the a ward in the Wandsworth hospital where he had been working. Nevinson’s experiences inspired him to become an unofficial war artist, and his painting La Mitrailleuse, of a machine-gun crew, which his friend Walter Sickert lauded as the “most authoritative and concentrated utterance of the war in the history of painting”, was launched to good effect in March 1916. This culminated in an exhibition at the Leicester Galleries, opening on 26 September 1916; Paintings and Drawings of War by C.R.W. Nevinson (Late Private R.A.M.C.). Welch suggests that the title of the show have have been deliberately ambiguous: “this, it could be argued, was an intentional military/publicity stunt in the light of the rising reputations of artist martyrs like Rupert Brooke and Henri Gaudier-Brzeska. The insinuation certainly appears to be that the artist was dead, presumably killed while in the service of his country with the ambulance corps” (Welch 140). The response to the show in the press was remarkable, particularly given the hostility that had usually been shown to him previously. He was regarded as someone who told the brutal truth about the war: he was “Warrior and Artist”. The Military Service (Review of Exceptions) Act became active on 5 April 1917, and rheumatic fever was not regarded as grounds for exemption. But there was talk that month of his becoming an official war artist, and in June his appointment was agreed by the Department of Information. He visited the front at the time of the Battle of Passchendaele, in July 1917, and flew with the Royal Flying Corps, and when he returned to London had material for a number of paintings and lithographs. The officials did not much like what he produced: they were dull (ironically, because the officials had expected futurist paintings, and what they got was much more conventional), or, in the case of the now much-reproduced painting to the right, “A Group of Soldiers”, they said that “the type of man represented is not worthy of the British Army”. Nevison’s response was vitriolic, making the point that the soldiers in the painting were sketched from a group home on leave from the Front that he had encountered on the London Underground. However, Nevinson was also painting pictures that were far removed from what was expected of a war artist: a portrait of two well-dressed society ladies, for instance, and entitled it “War Profiteers” (Welch 173). He also contravened the code by painting “Paths of Glory”, which depicted two dead soldiers lying in the mud: images of the dead were firmly forbidden. (The title comes from Gray’s Elegy Written in an English Country Churchyard: “the paths of glory lead but to the grave.”) Officials appreciated it even less when Nevinson exhibited it in March 1918 with brown paper pasted over it, on which was written the word “Censored”. Despite the difficulties, Nevinson worked extremely hard as a war artist: between August 1917 and February 1918 he produced nearly sixty oil paintings, pastels, watercolours and print (Ingleby et al., 36). In 1918, after some negotiation, Nevinson agreed to work for the British War Memorials Committee to produce a single large artwork. He refused the army’s offer of a temporary commission, which would make it easier for him to travel independently in France, but he did manage to make some sketches at the front which formed the basis for The Harvest of Battle, the largest single work he ever painted. Nevinson did not believe that it was accorded sufficient respect, and he fell out with a number of influential people and organisations, foreshadowing the problems he would continue to have with the establishment in the years between the wars. My information for Nevinson’s war experiences comes from Wikipedia, and from Michael J.K. Walsh’s excellent book C.R.W. 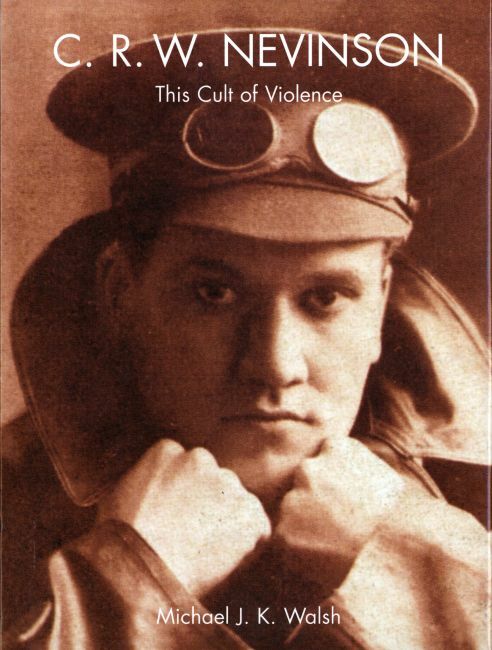 Nevinson: This Cult of Violence (New Haven and London: Yale University Press, 2002).